When the New York Times' list of the Best Illustrated Children's Books of the year comes out in November, I know it's time for me to start thinking about our house Mock Caldecott. But because the Best Illustrated books list doesn't have the same eligibility criteria as the Caldecott (namely, American-ness), there are always a few titles we can't consider. This year, two of my favorites on the NYT list are On a Magical Do-Nothing Day by Beatrice Alemagna (HarperCollins) and Town is by the Sea, written by Joanne Schwartz and illustrated by Sydney Smith (Groundwood); neither is eligible (Alemagna is Italian; Smith, Canadian). 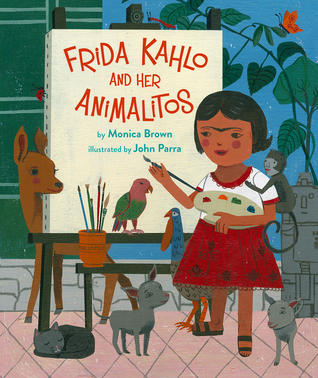 Thank goodness, then, for Frida Kahlo and her Animalitos by Monica Brown, illustrated by John Parra (NorthSouth). This book was a delightful surprise (to me, not to the NYT list)--I wasn't expecting Brown to use the characteristics of Kahlo's pets to illuminate the artist's own personality ("Frida was independent, like a cat! "), but it's an insightful and child-friendly approach. And Parra's acrylic on board illustrations are totally charming. I've read and reviewed a number of picture book biographies of Kahlo, and this one is my new favorite. It was also my Cybils nominee in the Elementary Nonfiction category. Congratulations to Monica and John, and to all of the authors and illustrators on this year's list!